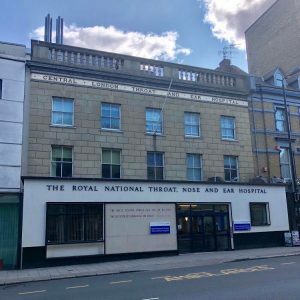 We are a busy specialist hospital located on Grays Inn Road. The department provides anaesthetic services for elective and emergency ENT and neuro-otology in an operating theatre suite of 4 theatres. We anaesthetise adults and children. We also provide anaesthesia for major head & neck procedures at UCH. Routine and difficult airway management, efficient day-case surgery and hypotensive anaesthesia is taught. There is an active sleep laboratory on site. We run a weekly tutorial programme on all aspects of ENT and H&N anaesthesia. In addition, there are monthly joint anaesthetic/surgical M&M meetings and half-day clinical governance sessions 4 times/year. Last updated 29th Aug 2018.